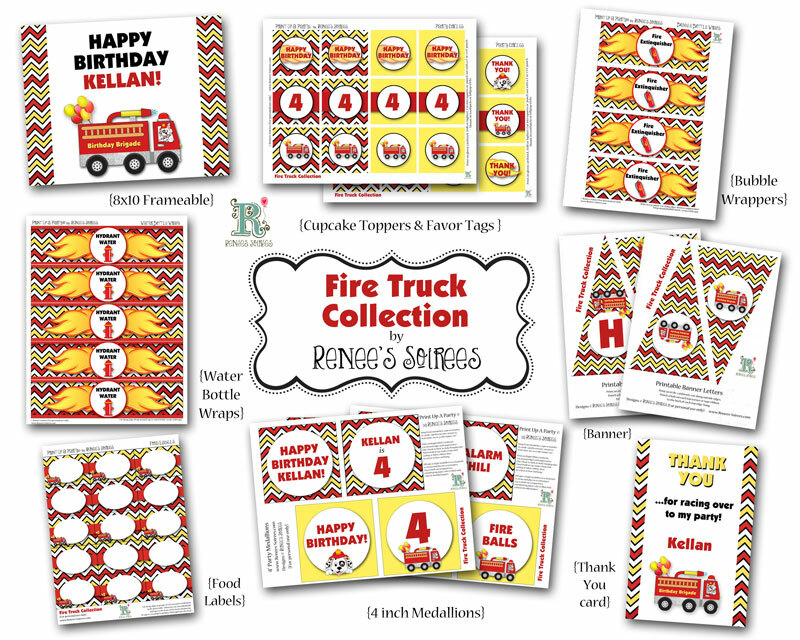 Thinking of throwing a firetruck party? 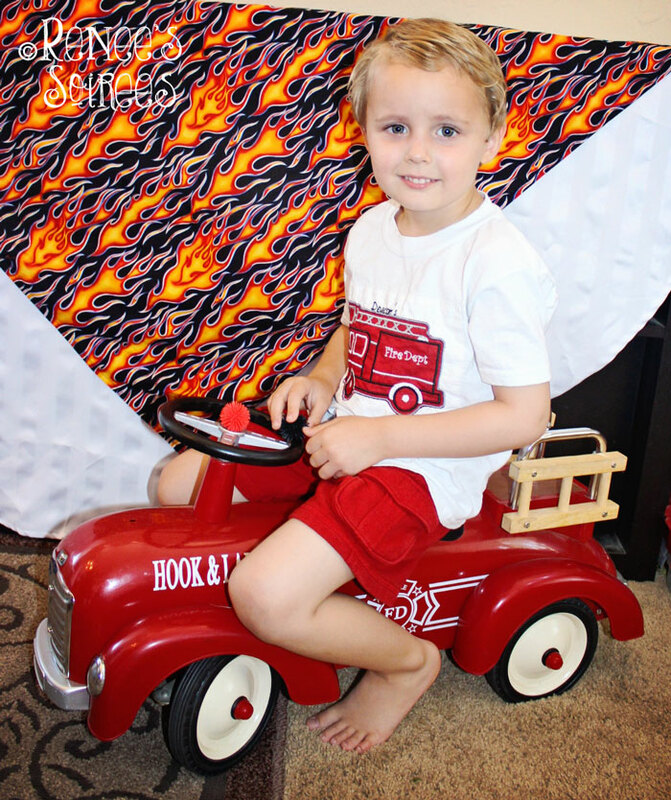 Have a little one obsessed fire trucks? 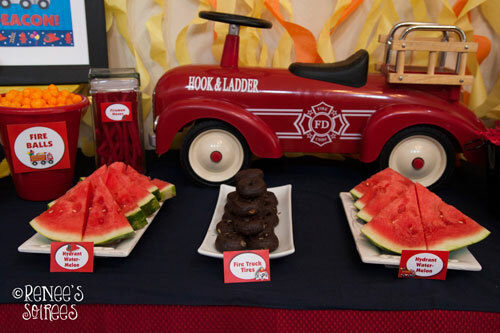 Or maybe you have a fireman retiring and need some food ideas. You are in the right place! 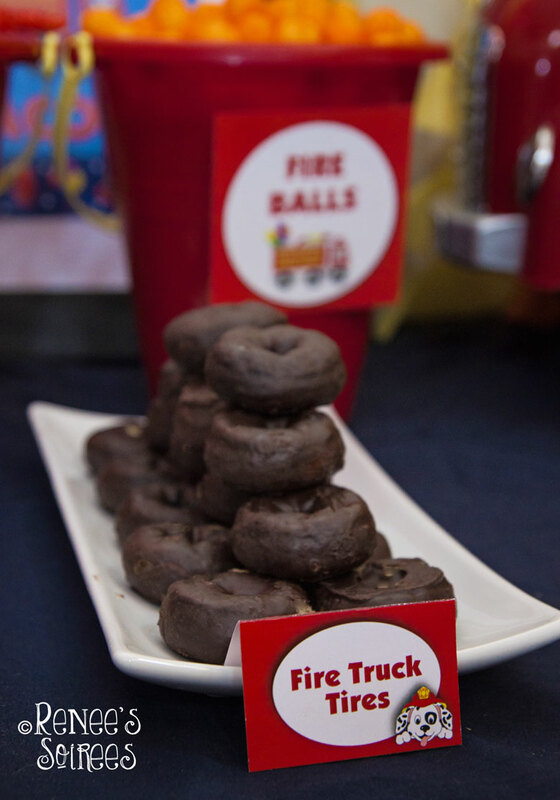 Our firetruck party doubled as a fundraiser. 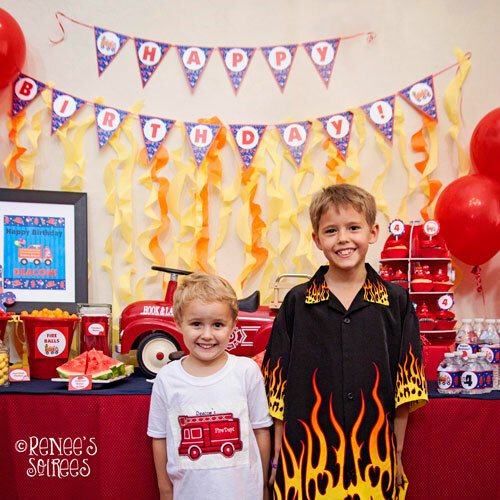 My son’s 4th birthday was already planned as a Firetruck-themed party, when 19 hotshot firefighters were lost in Yarnell, Arizona (just 2 hours from where we live). 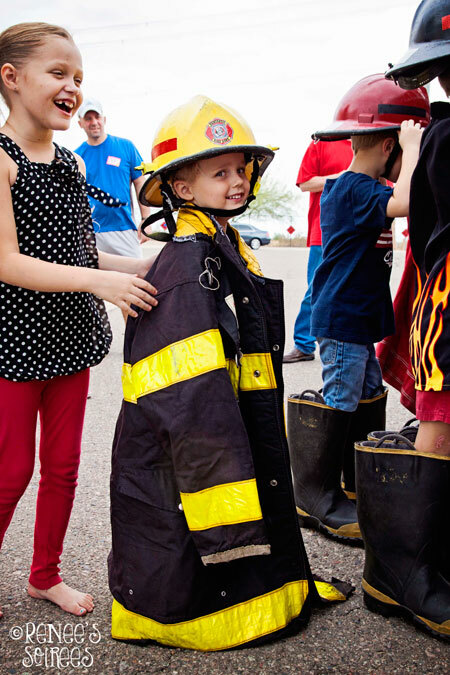 We were heartbroken by this tragedy, and decided to make his party a fundraiser, with proceeds going to a fund that had been created for the children of the fallen firefighters. 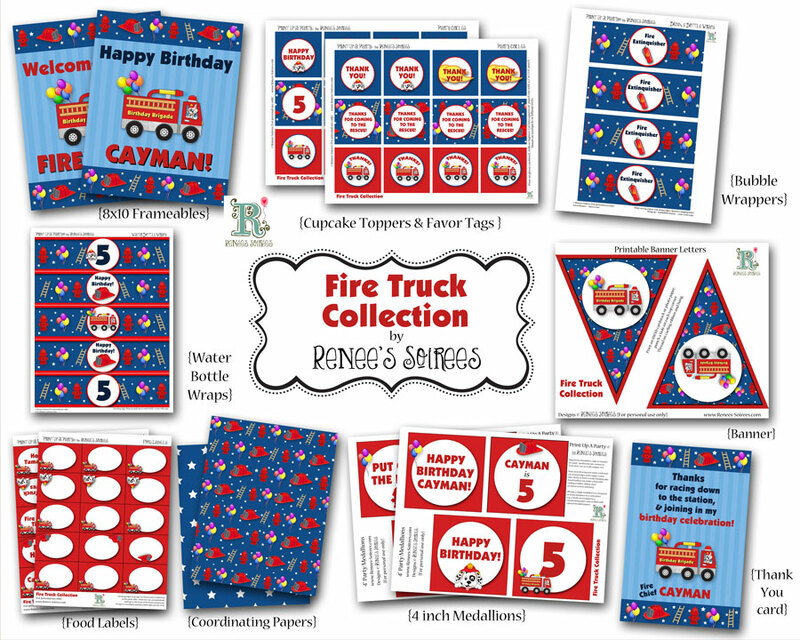 I created 2 different firetruck designs, one red and blue, and one red and yellow. 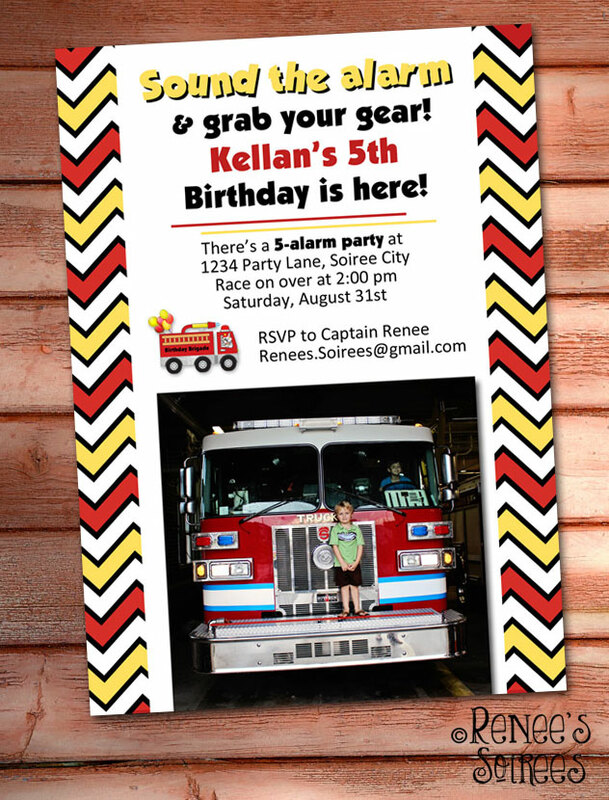 Here are the invitations available in my shop (blue one here, red & yellow one here). 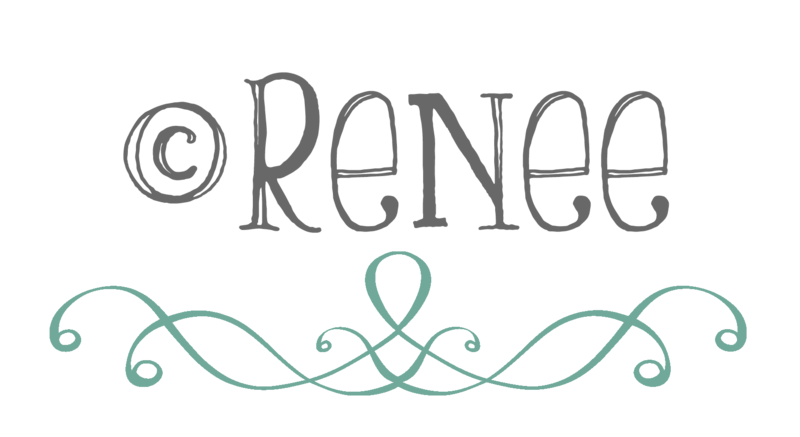 The invitations have a matching printable collection… one for each color scheme. 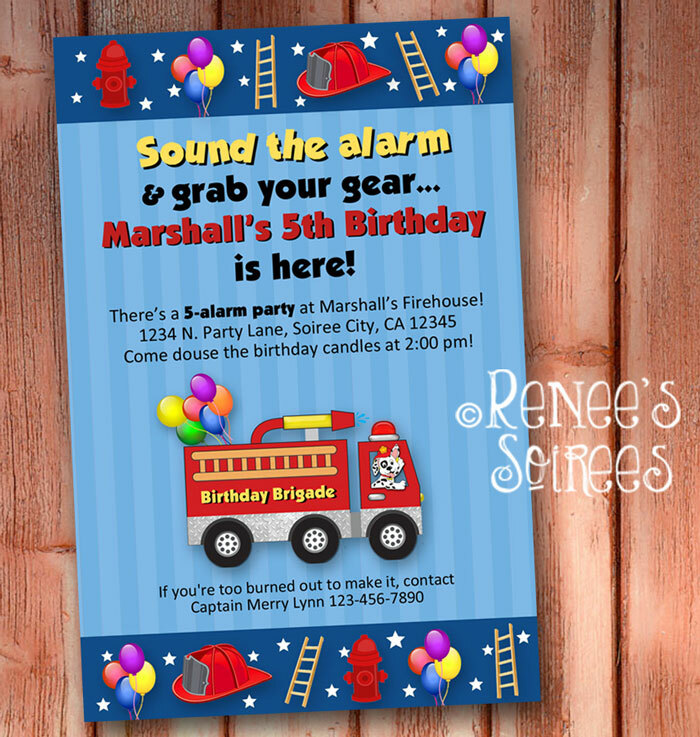 I used the 8×10″ frameable that comes with the Firetruck collection as a door sign. And the kids made a sign reminding people that this was a fundraiser. The firetruck toy was borrowed from a friend. 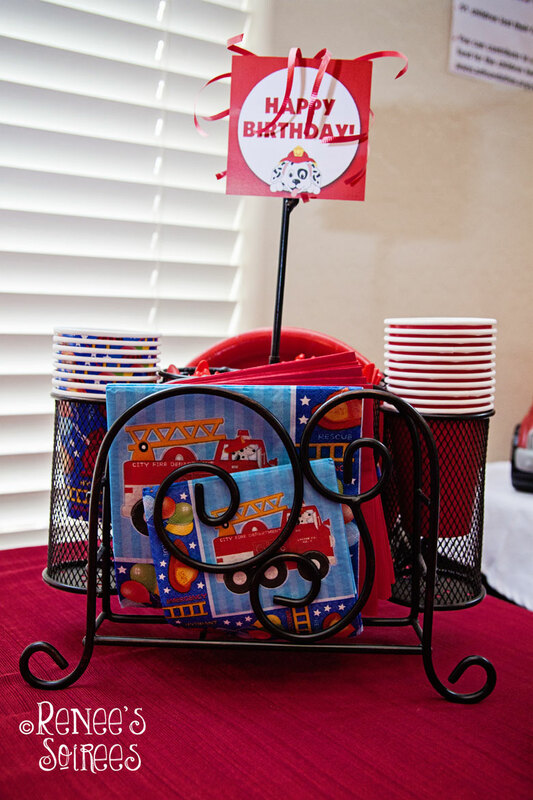 If your little one loves firetrucks, then you likely have a number of fire truck toys around to use as well! 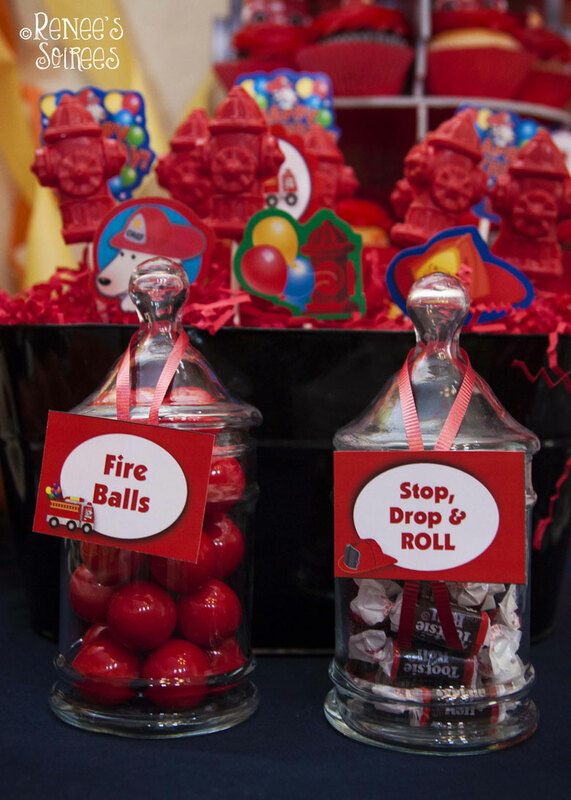 I made the chocolate fire hydrant lollipops in the background using red Candy Melt chocolates and lollipop sticks (both available at WalMart and craft stores), and a chocolate mold such as this one. 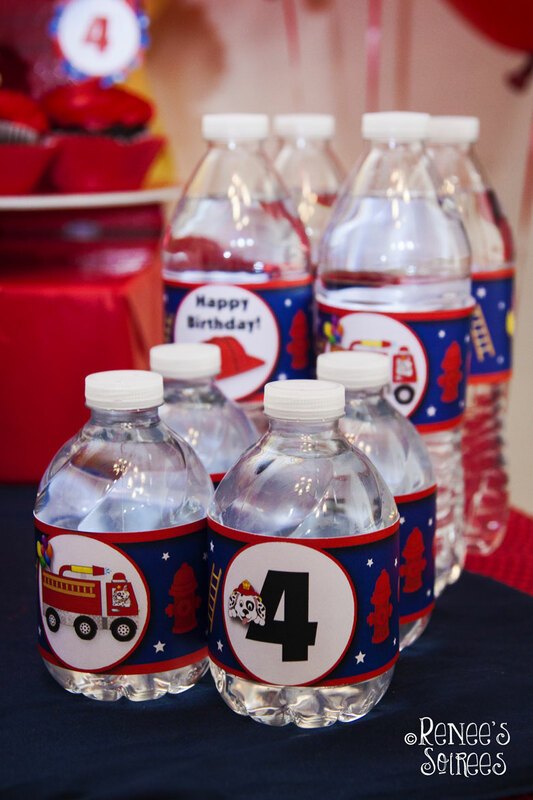 The Firetruck printables include a label that says “Put the Fire Out!” for your drink dispenser or cooler. 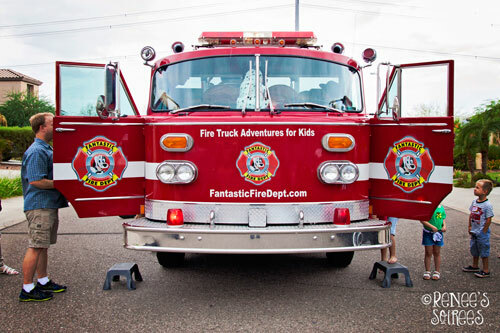 Entertainment was provided by a firetruck party company called Fantastic Firetruck. 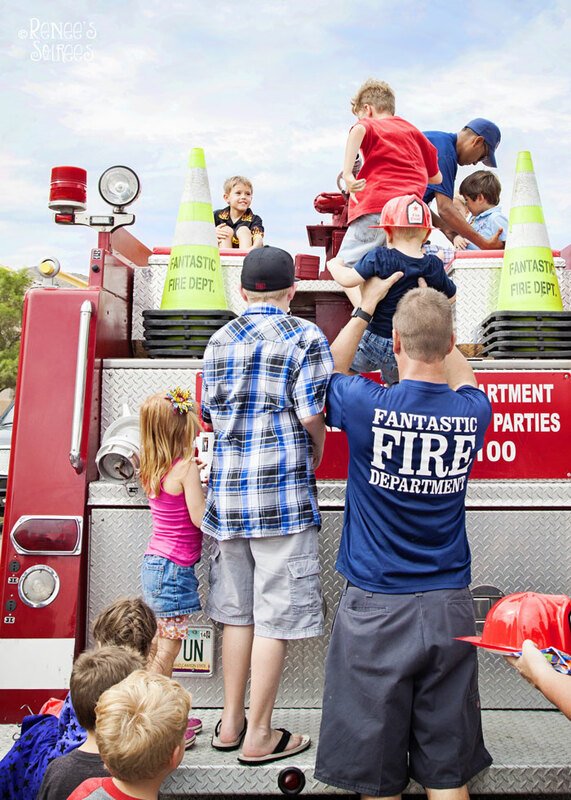 They set up games, and gave the kids a ride on a classic firetruck. 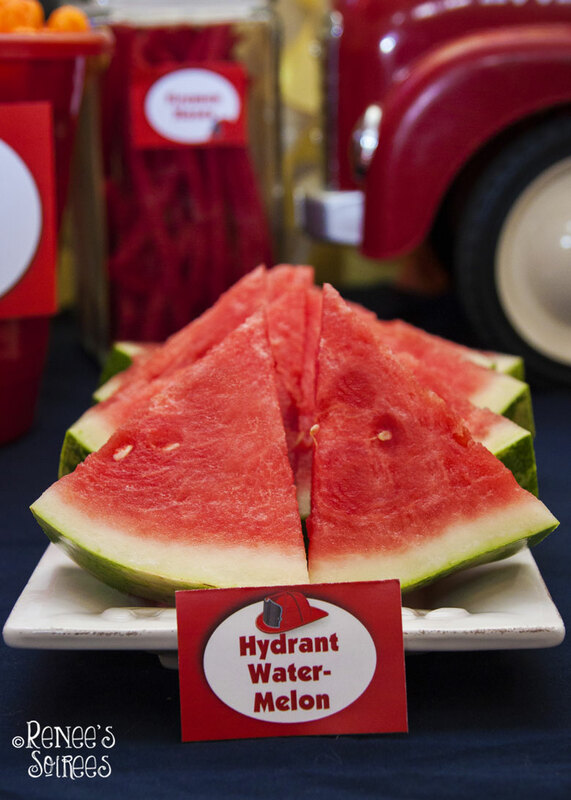 They have locations in metro Phoenix and south Florida. 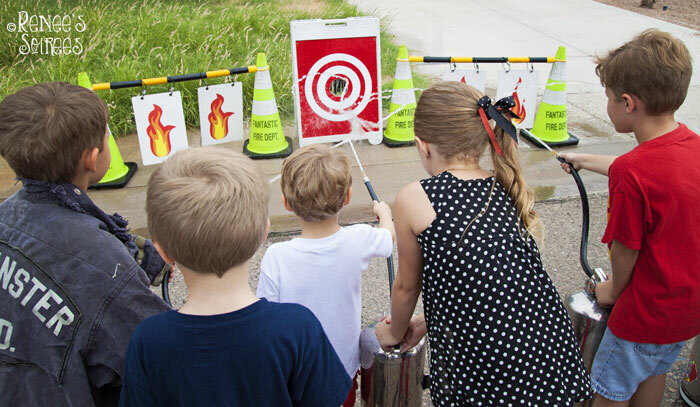 The kids were very excited about the truck and games, and it really made the party fun for all. 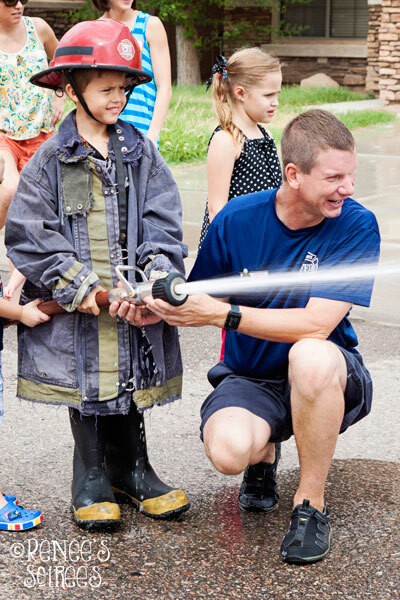 Chris, Fantastic Firetruck owner, and my oldest son. Chris was wonderful with the kids, and he does a magician show as well, that is absolutely hysterical. I’ve had him provide entertainment for two different parties, and I highly recommend him! 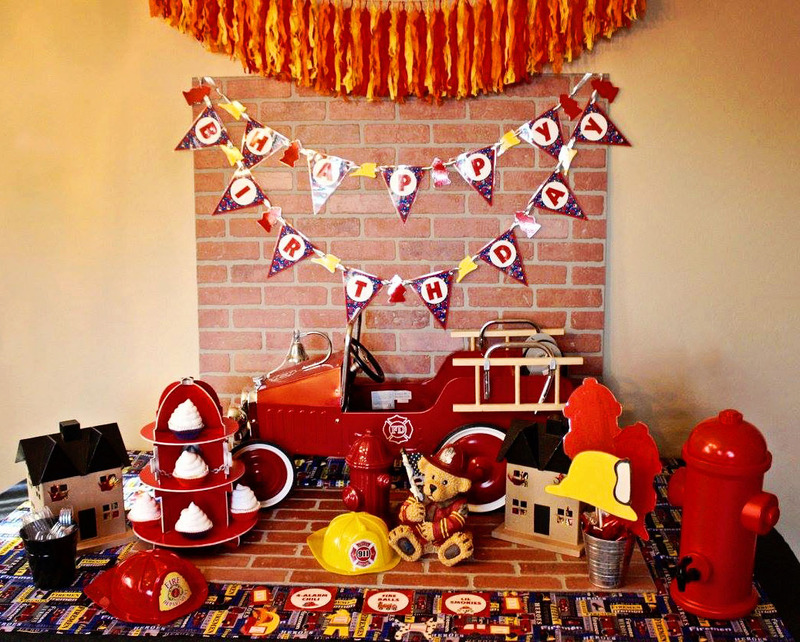 I added some fire truck stickers and small toys (from Party City) and Fire Truck Hershey Kisses, printed and shipped here. 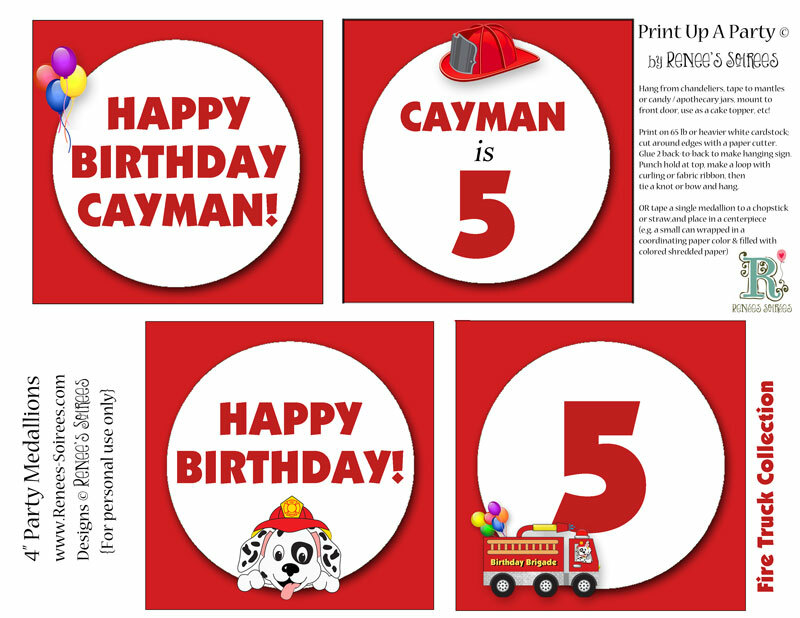 I also made Firetruck bubble labels (part of the collection, or available individually here… chose Firetruck from the drop-down menu) and put them on bubble bottles (3 for $1 at Dollar Tree). 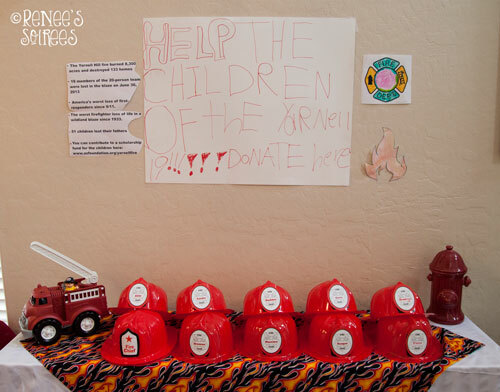 I added the names of the guests to the front of the firetrucks hats as a favor. 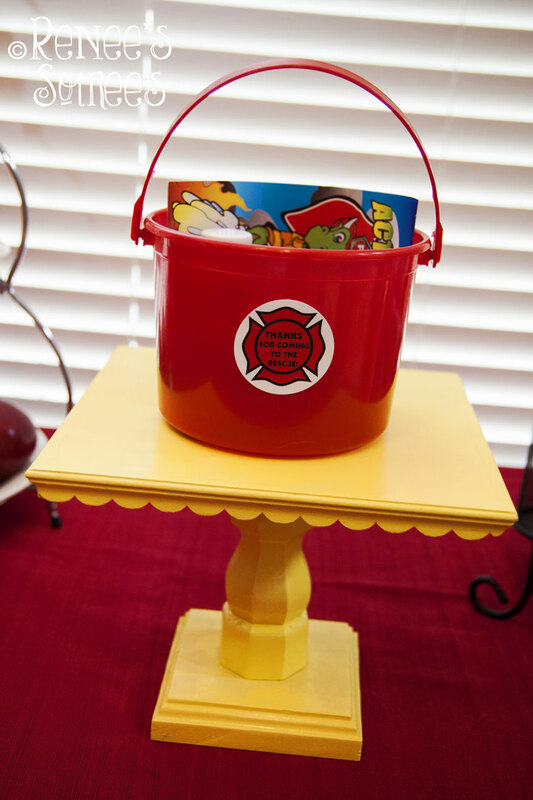 And the fire hydrant cookie jar was where guests put their donations. 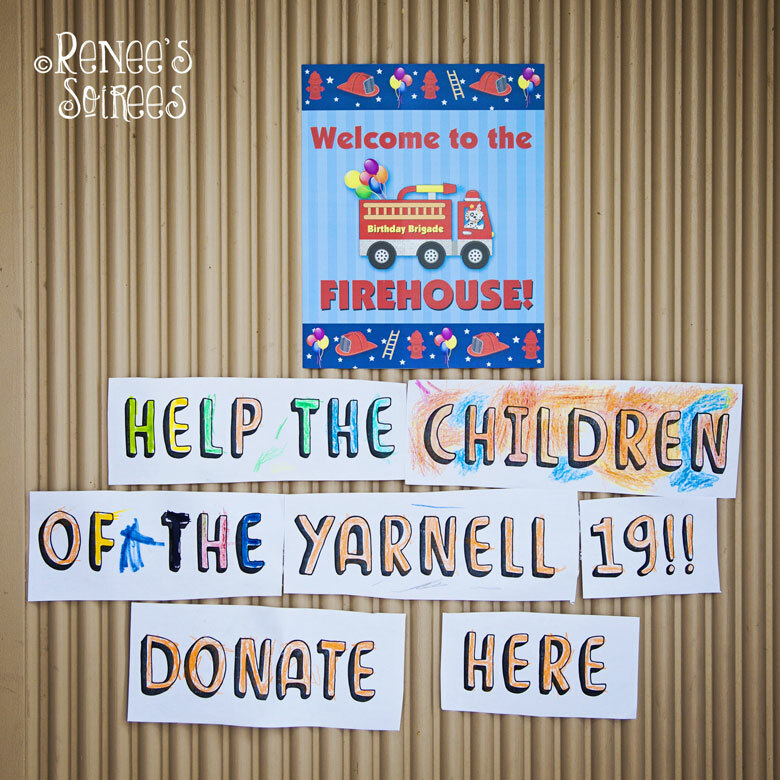 After all the funds were collected, we took the checks and cash from our fundraiser to the bank that was collecting for the Yarnell firefighters fund. 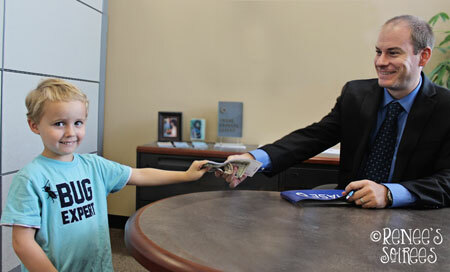 My 4 yr old was very proud that he raised $900 for the children who lost their daddies. If you would like to contribute as well, here are two legitimate funds. 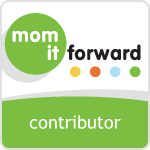 Be sure to properly vet your charity so your guests feel comfortable donating. One place to check is Charity Navigator. 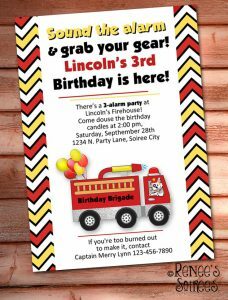 Note on the invitation that you are asking for donations in lieu of gifts, and name the charity so guests can decide look it up ahead of time and decide what level of donation they are comfortable with. Be prepared for questions like, “Do you really not want any gifts, and just donations?” Especially if your party is for a younger child. 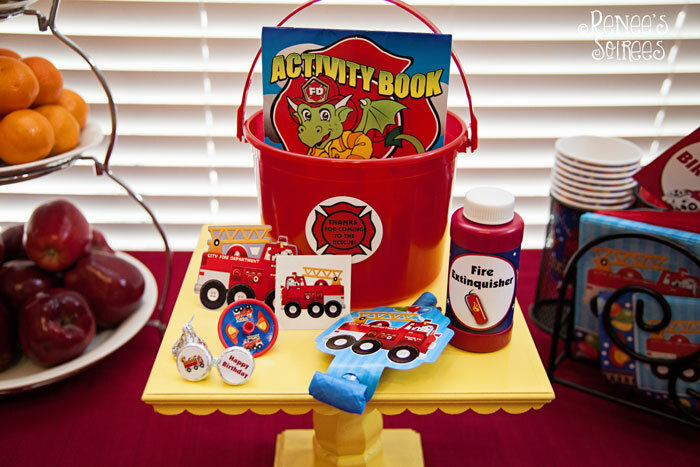 I told people that if they felt odd about showing up at a 4-year-old’s party without a gift, they could bring a Dollar Store gift, or even a used gift, like a pre-loved book off their own bookshelf. I also had the discussion with my son the morning of the party about how he might have fewer gifts to open, but that’s because we were helping the children who lost their daddies. He was on board from the early planning stages, so he was okay with that. And he still got a few gifts from Mom and Dad. Have a central collection point (I used a fire hydrant cookie jar), and post the charity name nearby, so guests know what to make checks out to. You definitely want them to make checks out to the charity and not to you (which just adds another step in your donation process). 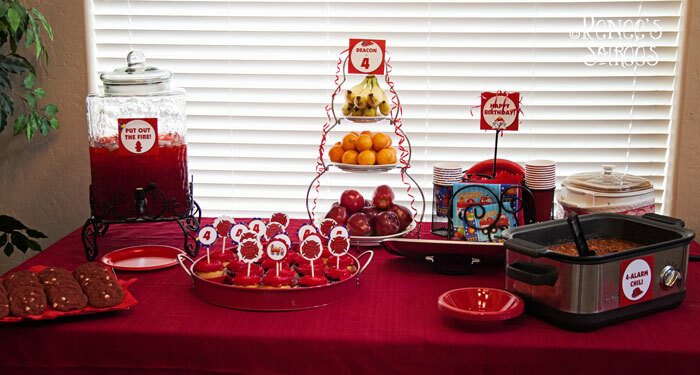 Follow up with your guests, letting them know what kind of impact they had. I emailed guests (and posted on Facebook) a photo of the deposit slip the bank gave me when I made the deposit, so everyone would know that all the money was turned over, and that our relatively small party had made quite a difference! 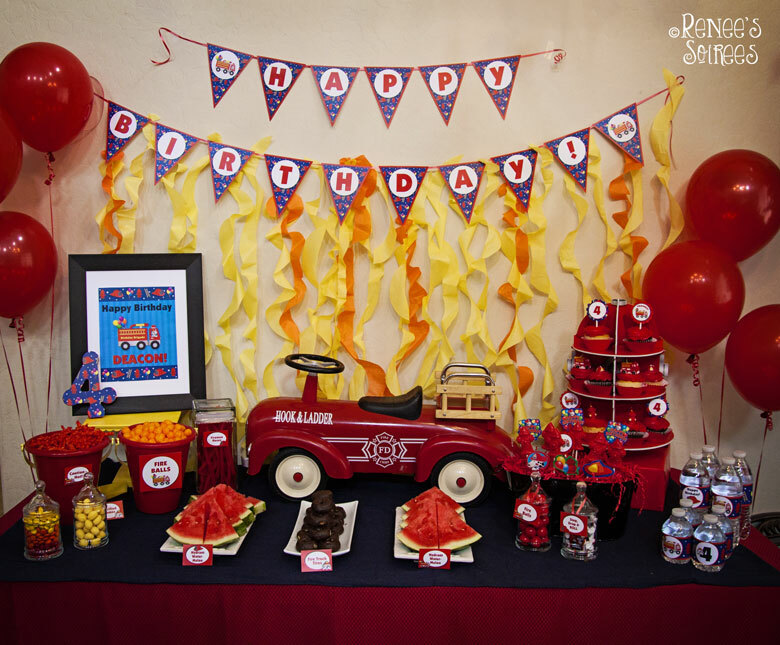 If you are in the Phoenix, Arizona area, you can rent a large bin of Firetruck party decor from Bins of Fun. 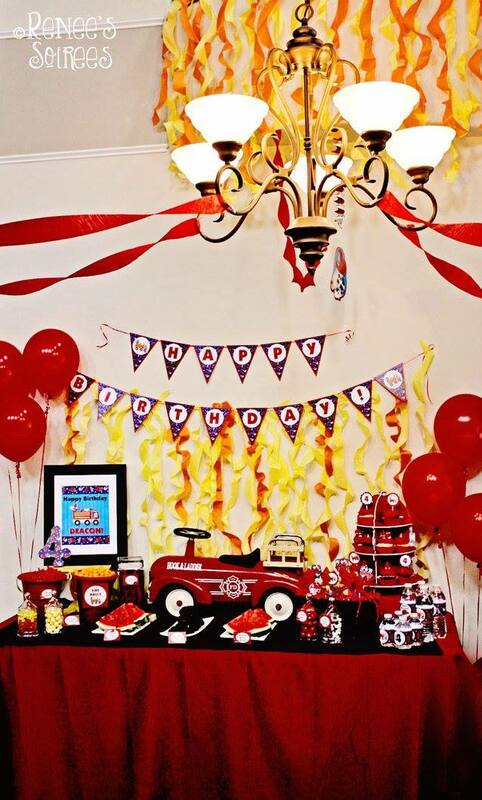 For $50 you can get a personalized invitation file (that you can print, email or text to invitees) as well as rent all the decor shown here, and more (fire party music CD, toddler fireman costume, etc). 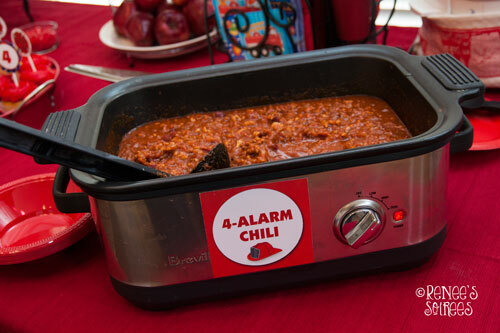 It’s an instant party! 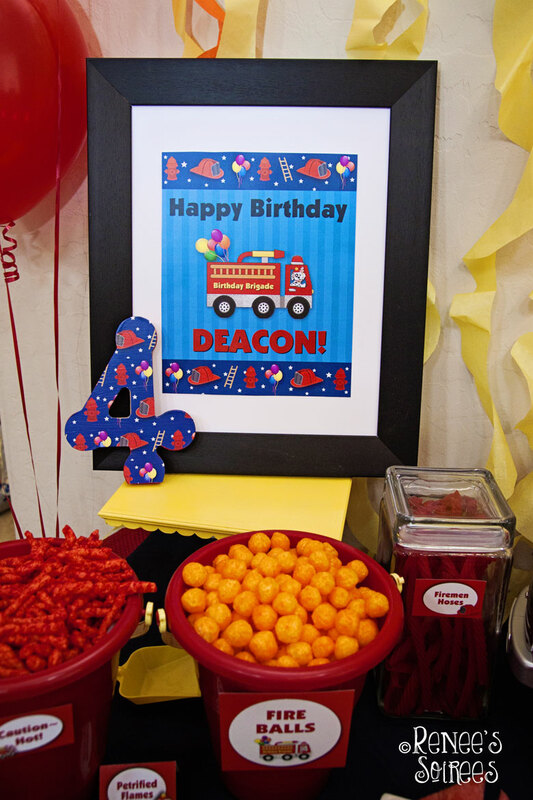 Hope you enjoyed this Firetruck Party as much as we did!